The Friends of McNabs Island Society awarded Waterfront Development our ‘Special Friend of the Island’ award at our 26th Annual General Meeting held on Wednesday, April 13 at the Maritime Museum of the Atlantic on the Halifax Waterfront. Waterfront Development staff accept the Friend of the Island award. From L-R: TJ Maguire, Adam Langley, Kelly Rose and Jennifer Angel. Photo Rochelle Owen. (April 15, 2016) The Friends of McNabs Island Society awarded Waterfront Development our ‘Special Friend of the Island’ award at our 26th Annual General Meeting held on Wednesday, April 13 at the Maritime Museum of the Atlantic on the Halifax Waterfront. 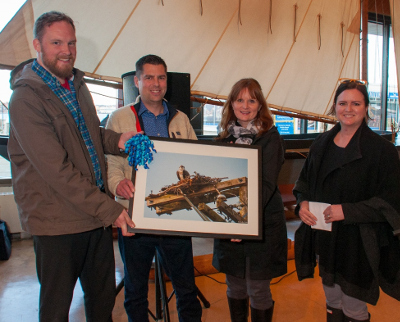 Waterfront Development staff accepted the award - a framed print of Rochelle Owen’s photograph of the McNabs Island Osprey that calls the island home. Over the past several years, the Friends have raised $500,000 to rebuild some trails, install a composting toilet and a visitor information kiosk. Then two years ago, Waterfront Development approached the Friends to see how the provincial crown corporation could help. Through a partnership with the Friends of McNabs Island and the Nova Scotia Department of Natural Resources, Waterfront Development invested in the development of several new park amenities. “Our partnership with Friends of McNabs Island has accomplished great things. The most important of which is inspiring new explorers to visit the island -- a very special place in our harbour,” says Jennifer Angel, Acting CEO, Waterfront Development. 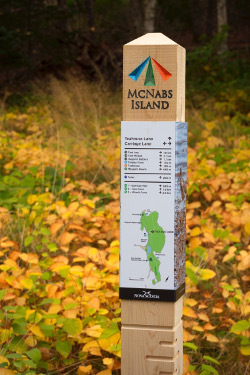 McNabs Island Wayfinding Trail Sign. Photo TJ Maguire. New wayfinding trail signs that blend in well with the island’s natural environment and provide for enhanced, self-directed exploration, were designed by Sperry Design and installed by New Century Signs along the 18 kms of island trails, and two additional Clivus Multrum composting toilets were put in place for island visitors. To reduce congestion at Garrison Pier, the main access point to the island, Waterfront Development installed new floating docks for boaters. “We recognize the forward thinking of Waterfront Development in helping make McNabs Island Provincial Park more welcoming for island visitors and very much appreciate their support,” says Cathy McCarthy of Friends of McNabs Island. Friends of McNabs Island Society is a volunteer-driven, registered charity dedicated to preserving and protecting McNabs and Lawlor Island Provincial Park. Since 1990, the Friends of McNabs have improved the trails and park facilities, organized community beach cleanups and offered guided tours to island visitors – making McNabs Island a welcoming park for everyone. McNabs Island Beach Cleanup hauls in dozens of lobster traps, old bottles, an old deep freezer, a toilet and an assortment of plastic toys.